BFF #12: What's the deal with the naked sauna thing? Hey all and welcome to our last episode of BeFriending Finland! Dozen is a nice roundish figure to stop at, don't you think? 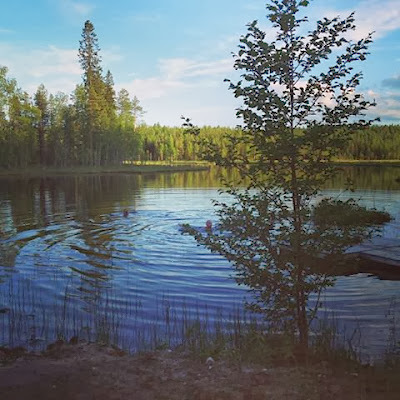 We've had a peculiar road and I think it is only fitting to end our series with a post about the sauna - the most peculiar thing in Finland of all times. When I started eleven episodes ago, I told you about the Finn's need of a personal space. Yesterday I got an excellent comment from Bob who, after living 14 years in Finland (go Bob! ), has noticed that though we like space we love closeness. This impression he has gotten in a sauna. Wait... where? 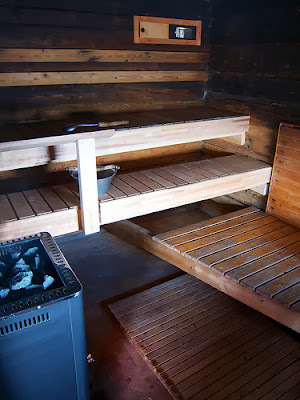 A sauna is a room with a stove (or is a heater a more proper term? ), which you heat up with either wood or electricity until the room temperature is at least 70 degrees Celsius. Then you strip naked, often in a group, sit on these long wooden benches and throw water on the stove to produce hot steam. In the sauna you sit, you sweat, you talk (or not) and purely enjoy the heat until you're done. Sometimes you might even beat yourself or each other gently with branches of a birch. Okay, written out like that it really sounds crazy. And what makes the sauna even a more crazy concept is that, like Bob said, you can sit very closely in the sauna - even with strangers and with both sexes present! Now this must sound very contradictory to you after the talk about personal space. And perhaps it is. But I think that maybe in this vast, expansive country, where winters are snowy and dark, and where there's more personal space anyone can come up a use with, we have figured out a cultural context in which we can purely enjoy the company of each other. A context where you can get a little bit closer to others in a non-sexual environment. A context where it is quite okay to strip naked, both physically and personally, because in a sauna we are all simply human beings without any makeup. It's also common to run from the sauna to a lake or a pond. Sauna is a good excuse to get friends over. It's a time families spent together. It brings people closer and takes away the barrier that we normally build. It is also respectful tradition since in the sauna it is not okay to stare or act offensive in any way. That is why it's okay to have both sexes present in one sauna, even though public saunas regularly have different sides for men and women. of the sauna. A sauna is friendly, respectful but not so personal tradition. And most of all - it's fun! It has also been fun to share some insights about Finnish culture with. Thank you for sharing, for commenting and for being interested in the matter. If you come up with good ideas of a blog post, a good story or any other thing you might wan't to tell me about, don't hesitate to send me an email: aliisainwonderland (a) gmail.com.